There is only one legal international border crossing between Pakistan and India and it sits in the Punjab province of each country (at partition Punjab was split in two). Its an easy trip from Delhi on a speedy day train or a slow night train at less than half the price (we took the night train). 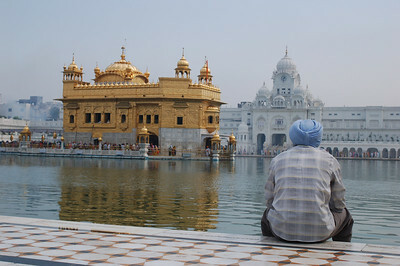 The train brings you as far as the holy city of Amritsar and we arrived there early in the day. We spent all morning taking in the city and its calm, welcoming atmosphere. We knew we were suprised when we asked a rickshaw driver the cost of a ride to the Golden Temple and he directed us to the free shuttle bus. Being home to the Sikh's foremost pilgrimage sight, the Golden Temple, Amritsar is set up for accomodating loads of visitors. There are free shuttle buses connecting the main transport hubs to the Golden Temple. At the temple itself there are free dormitories and free meal. The temple's community kitchen serves hot meals to hundreds every day, with charity enshrined into Sikhism by the motto "Service to humanity is service to God". Noticeably absent from the temple grounds is the usual crowd of begging destitute children and elderly. The grounds, including the huge pool with bathers surrounding the temple (that is actually golden) hum with activity but seem to retain a certain calmness and serenity. After our visit we took advantage of the free beds and slept for a few hours before begining the journey to Pakistan. The bus ride to the Indian border town of Attari took a little over an hour, and we split a rickshaw drive to customs with the only other tourist crossing into Pakistan. We filled out lots of forms and passed through lots of different buildings before finally entering no-man's land. Here porters shuttle bags back and forth, Indian and Pakistani porters each wearing distinct uniforms to make sure each remain on the correct side of the border. Entering the Pakistani side we had to fill out more forms and then we headed to the bag checking area. The guards brought Yann into a room where he had to answer lots of questions mostly pertaining to the amount of money he made. I got to wait outside with our bags and another guard who also chatted me up in a friendly manner and a crazy old man who got me a glass of water. When Yann exited the room the bag checking guard asked to see all his money, when he saw the American money he offered an exchange to Pakistani rupees, which we didn't need as our American money is just an emergency reserve. He insisted, whispering that he wouldn't open our bags if we just changed 20$ with him. Yann was friendly but persistently refused to change money. The guard smiled, didn't check our bags and let us go. 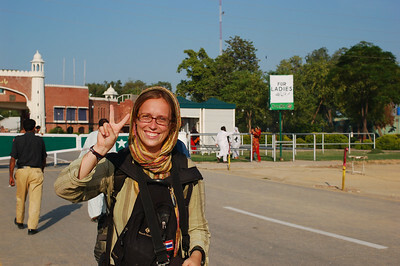 We then had a long wait until the the border closure at sunset, and we tried to decide whether or not we should stay for the big show or move onwards to Lahore. We weren't especially keen on travelling at night into the big city (we usually avoid night travel) but when three other tourists crossed the border the six of us decided to stick around for the ceremony. At about 5:30 busloads of Pakistanis began arriving at the border stadium, so we joined the crowds to get good seats. This wasn't necessary because foreigners are ushered to the "VIP section" right at the front, men on one side, women and children on the other. As people file in to their seats, a few rabble rousers entered the stadium dressed in green and white outfits carrying huge Pakistani flags. Loud roars emerged from the men's side of the stadium while the women clapped furiously. I was sandwiched amongst a crowd of happy children that were cheering their hearts out and I couldn't resist yelling along with them. The only cheer that that I understood was the popular "Pakistan Zindabad" (long live Pakistan). I refrained from shouting when the cheers mentioned Allah, (my guess at the translation, something along the lines of: Who's the best? Allah! ), while Yann refrained from all chanting (party pooper, thats right!). 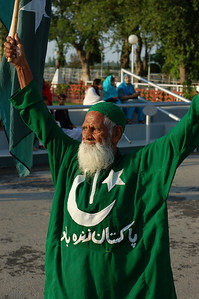 The atmosphere in the crowd was awesome with the two rabble rousers taunting the equally loud Indian crowd on the other side of the gate, waving their Pakistani flags like they hadn't been doing it every day for years, or for one, judging by his age, probably since partition. When the soldiers arrived on the scene the crowd went crazy, with a respectable looking man next to Yann shouting at the top of his lungs "there go the Tigers, roooaaaaaaaarrrrr!". 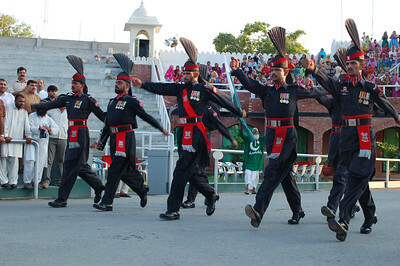 The guards chosen for the ceremony are probably the ten largest men in Pakistan, and are made even larger by their huge boots and foot high accordion-like helmets. They are dressed in black with red trim and are seriously the toughest looking guys I've ever seen. The don't march, they fly, covering unbelivable distance with their monster strides. And when the crowd isn't cheering, the only sound in the place is the stomping of their gigantic boots. After some preliminary marching they brought out the big guns, the hugest meanest looking soldier of them all. He criss-crossed the pavement, stomping and kicking his leg all the way up to his nose as he stomped (and we have evidence to prove it!). The ceremony ends with the soldiers lining up at the border, opening the gates and shaking hands with the Indian soldiers on the other side. 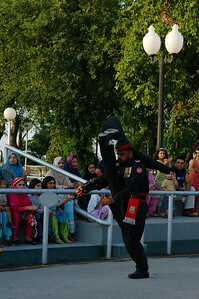 Each team of soldiers then pulls down their respective flags in a complicated routine. Quite frankly, the Indian Army didn't seem to have recruited for size or intimidation factor, the Pakistanis tower over the khaki-clad Indians. The stadium on the Indian side was definetely more full than the Pakistani one, but what the Pakistanis lack in numbers they make up in passion. The children next to me beamed with excitement and pride and when I asked them if it was their first time at the ceremony they exclaimed :"No! of course not!". Getting to Lahore was easier than we thought, we just followed the crowds into the public buses waiting nearby. I was quickly shooed away, and was feeling a little bit confused until I realised that each bus is divided into two compartments (separated by a metal wall), one for ladies and one for men. So I left Yann and boarded the separate door at the front to join the other women. I was berated by friendly smiles, handshakes and offers of seating. One woman bought me an ice cream at a stop on the way to Lahore, and two teenage girls requested that I become their sister. They called through the grill to their father in the back of the bus. He handed them a camera and shouted instructions at them as they attempted to take my photo. It had been a long time since I had felt so welcomed and comfortable. After transfering buses we arrived at a popular hostel in Lahore, dropped our bags and made it to the grocery store just before closing time. I got a loaf of bread, peanut butter and a ginger ale meanwhile Yann was outside at the busy chicken shawarma stand. We ate, then collapsed in bed after a long, amazing day. Vous nous montrez de très belles photos et très beaux récits qui démystifient le peuple Sikh. PS: les enfants; je ne comprend pas que vous soyez impressionnés par une performance physique aussi anodine. Votre père performe ce geste à tous les jours loin des regardes indiscrets.